Elasto Proxy, supplier of specialty seals and custom insulation, announces fireproof rubber products for vehicles and transportation. Sealing specialists help with material selection, and can design and custom-fabricate door and window seals, acoustic and thermal insulation, and many other fireproof rubber parts that meet standards and specifications for flammability, toxicity, burn rate, and fire safety. As Elasto Proxy explains in a new technical article, How to Choose Fireproof Rubber Products, buyers prefer lightweight rubber materials, but some combustion reactions can produce toxins that endanger human health. Elasto Proxy, global supplier of custom seals and specialty insulation, is announcing fireproof rubber products for automotive, aerospace, marine, and mass transit applications. Designed for cars, buses, trains, trucks, ships, boats, and airplanes, these interior and exterior vehicle components use fireproof materials that meet industry standards and fire protection specifications. Fireproof rubber is used in door seals, window seals, floor coverings and ceiling liners, wall panels, seat pads, and mattress frames. Fireproof materials are also used in the cellular foams for armrests, acoustic insulation for passenger cars, and thermal insulation for engine bays. Outside the vehicle, rubbers parts such as end caps and roof housings must resist fire. Fireproof gaskets and hose are also available. As Elasto Proxy explains in a new technical article, How to Choose Fireproof Rubber Products, buyers prefer lightweight rubber materials, but some combustion reactions can produce toxins that endanger human health. Reducing a vehicle’s weight may help to reduce fuel consumption, but material selection can’t come at the expense of passenger safety. Application requirements and technical specifications are important, but buyers in the mass transit industry need to meet standards such as UL-94 for flammability and Bombardier SMP 800-C for the release of toxic gases. Fire, smoke, and toxicity (FST) tests for buses, railcars, and subways also include ASTM E1354, which measures heat release and smoke development. As Elasto Proxy explains in its online article, standards for fireproof rubber may vary by industry, location, and manufacturer. Aerospace engineers may need to source rubber that meets ABD 0031 from Airbus, or BSS 7238 and BSS 7239 from Boeing. For buyers in the automotive and mass transit industries, FMVSS 302 defines burn resistance requirements for the rubber used in occupant compartments. Marine buyers also need to consider industry-specific requirements and fire safety standards. In addition to a nine-part fire testing standard from IMO, boat and shipbuilders may need to source materials that met NFPA 130:210 from the NFPA. As Elasto Proxy’s new article explains, this fire protection standard incorporates ASTM standards as well as Bombardier SMP-800C. 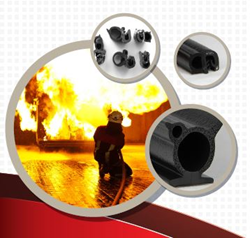 For more information about fireproof rubber products, contact Elasto Proxy or request a quote today.